I wish I would have seen this image when it was first released by North Korea about 10-11 days ago. 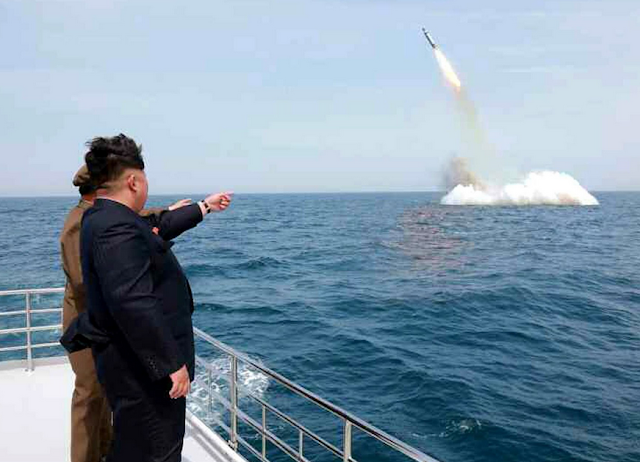 It purports to capture Kim Jong-un and a senior unidentified military commander witnessing a test firing of a missile from a submarine. North Korea also stated that they have made significant advancement with respect to miniaturization of nuclear warheads such that they could be launched by this or similar weapon systems (which they've claimed before - and it's been questioned by experts). This of course worries many people. On Tuesday, senior U.S. military officials announced that this image was Photoshopped - and that North Korea is in fact, NOT yet capable of launching ballistic missiles from submarines. Note Kim Jong-un's body orientation - his shoulders, torso, abdomen, hips and lower extremities are all angled significantly away from the missile and its alleged ocean-exit. We point our bodies towards that which we respect, are attracted to and/or towards that which commands our interest and focus. The orientation of Kim's body strongly shouts significant nonchalance - not such a national event of importance and pride. The angle of Kim's left arm is wrong. Not only is it obviously too low (missiles don't accelerate that quickly when they first ocean-exit or launch, so Kim and the other man would not have difficulty keeping up with their pointing as it ascended) - but his finger/hand/arm are pointed too far to the right of both the missile and its ocean-exit point. However much more significantly - PEOPLE DON'T POINT AT EXPECTED EVENTS (surprises, yes - or if they see something amiss or out of context, yes - but not expected events like this) - it's unnatural and feigned. 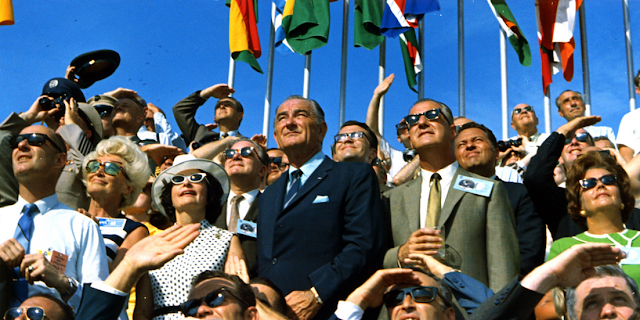 Look at the image below of Lyndon Johnson and Lady Bird Johnson and many surrounding them at the launch of Apollo XI (The first mission to land astronauts on the Moon). While a good number of them are shielding their eyes from the Sun - NO ONE IS POINTING! Also, note that their bodies are entirely oriented (feet, hips, torso, neck/head) at the Saturn V - although it was more than three miles away. North Korea's rocket is a certainly a smaller one, however Kim is allegedly much closer. Anyone expecting the missile launch would not point and would be completely (their entire body) turned towards it. What may seem insignificant to some - is very indicative of a ruse in this context - the relaxed right hand of Kim's. If he were truly pointing at a significant event (also very loud, and close and potentially dangerous) with one hand/arm - his other hand would not be relaxed - it would show significant tension and be touching his upper chest (sternum, over his heart, etc.) and/or significantly closed. It would not be relaxed. Again - this screams of a casual-indifference - and thus it's feigned.